The Investigate dashboard enables you to view pivot tables of metrics and attributes for all API traffic and compare relational activity between metrics to investigate and diagnose issues faster. You can access data for the past 30 days in the dashboard. Status Code lets you investigate status code metrics for API proxies and target services. 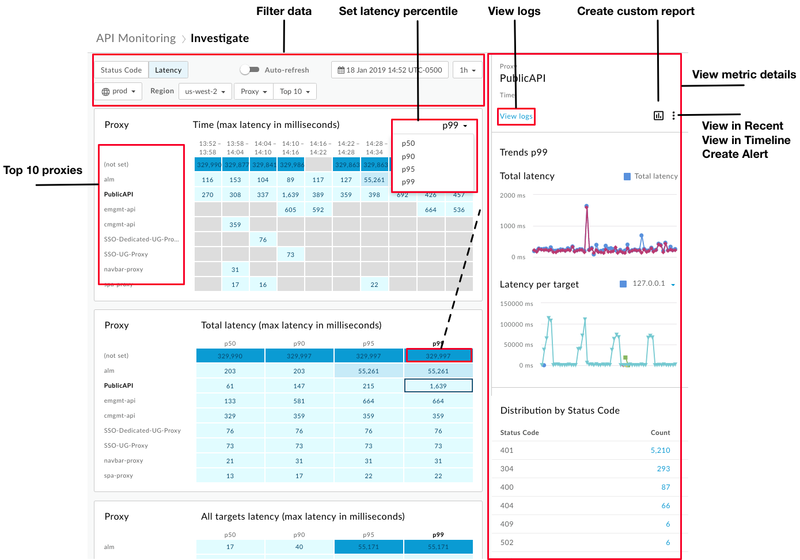 Latency lets you investigate latency issues for API proxies and target services. You can also investigate issues caused by a specific alert in the Investigate dashboard. When an alert occurs, click the name of the alert in the Alert History page to opent the alert in the Invesitgate dashboard. View the fault code versus time matrix to view the fault code activity over the last hour. Switch to the fault code versus HTTP status matrix to identify specific HTTP status codes associated with the fault codes whose counts have increased over the last hour, as identified in the previous step. Switch to the fault code versus Proxy matrix to identify the API proxies that are triggering the fault codes identified in the previous step. 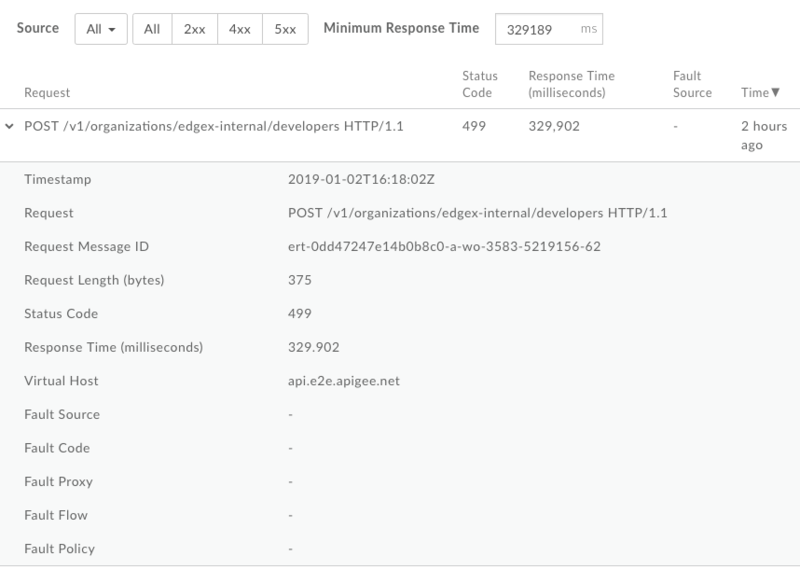 Click a box in the matrix that is associated with an API proxy with a high volume of fault codes to view more details and access logs. Set up an alert and create a custom report to further assist with diagnosing the issue. Further troubleshoot the API proxy using trace and other tools to identify a resolution to the issue. 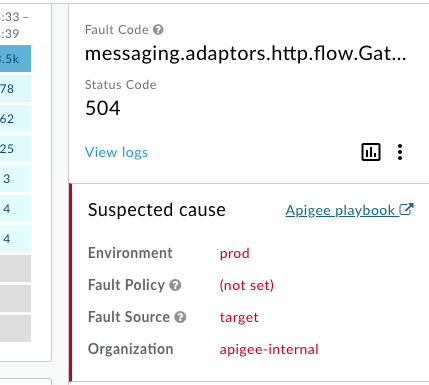 Apigee provides a set of fault codes that help you to diagnose issues. For example, a typical issue resulting in a 4xx or 5xx HTTP status code can be classified using one or more fault codes. API Monitoring enables you to drill down on fault code categories, subcategories, and individual fault codes to diagnose issues faster. If the API proxy or target service does not have a value or cannot be determined, the dashboard will display "not set" as the origin. For more information, see Why do I see "not set" in the dashboards? 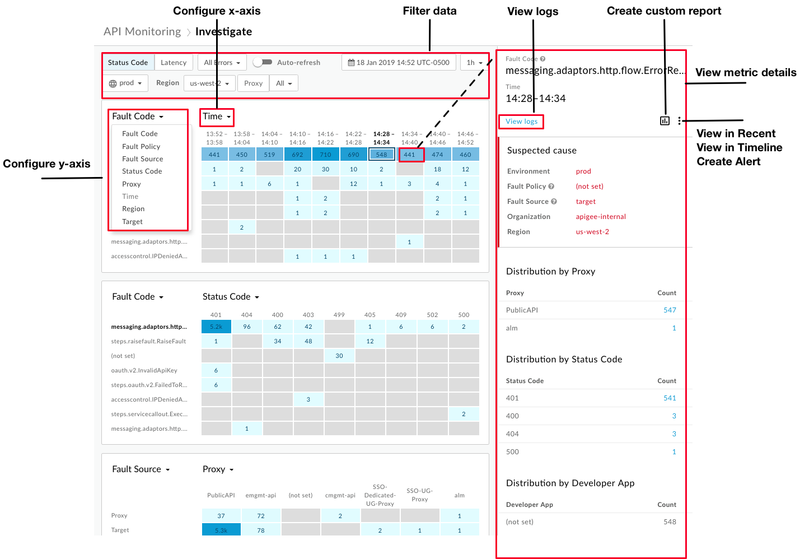 The Status Code dashboard lets you investigate status code metrics for the API proxies and target services in your organization. You can view status code metrics for a one-hour or four-hour window at any time in the past 30 days. Configure each matrix by setting its x-axis and y-axis to compare the relational activity between metrics and gain more insights. Quickly identify the metrics that are experiencing the highest relative volumes based on the color shading of a block. The darker the block, the higher the relative volume. Click a block in the matrix to view metric details. Note: Options are grayed out if they are not applicable to the currently selected context. Access logs in the metric details panel. View the current context in the Recent or Timeline or dashboard by clicking > View in Recent or View in Timeline, respectively. Create a custom report and add additional dimensions by clicking . Create an alert and add additional alert conditions, set up notifications, and generate a custom report based on the alert. 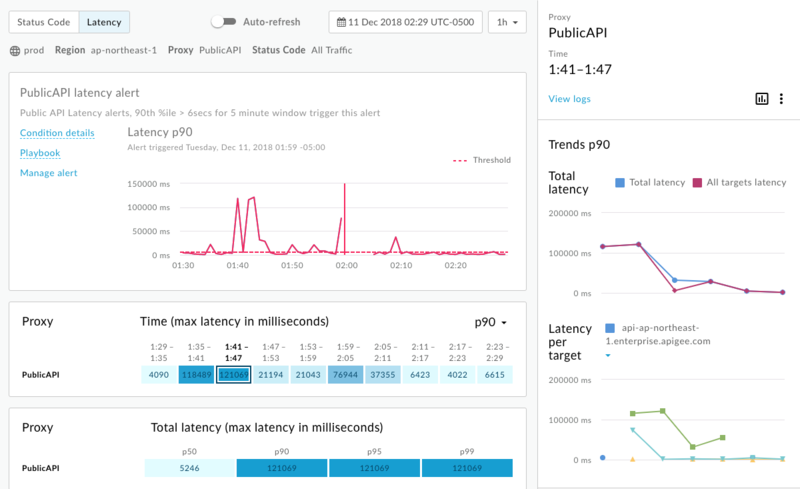 Note: For the Latency dashboard, you can only configure the total response latency percentile (p50, p90, p95, p99). View details for a particular metric by clicking its block in the matrix. 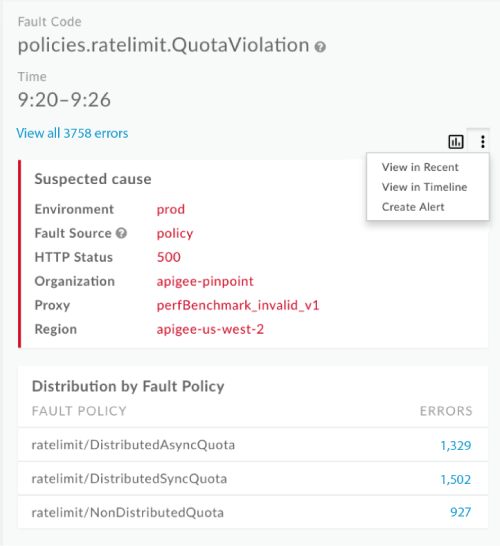 Fault Policy - Information about the policy that triggered the runtime error, including policy type (internal name) and user-defined policy name. 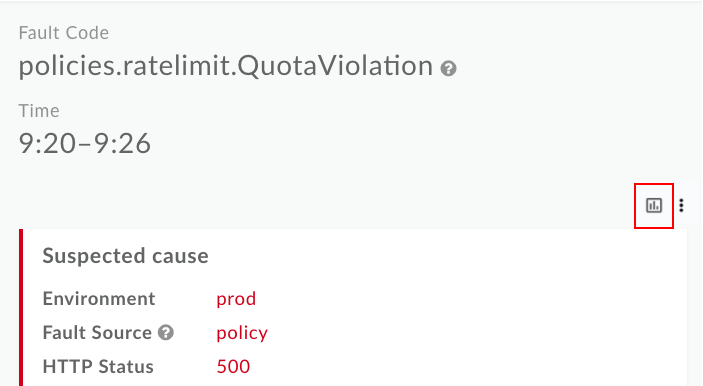 You define the name when attaching the policy to the API proxy flow. The Latency dashboard displays latency information for the API proxies and target services in your organization. You can investigate latency metrics for a one-hour winow at any time in the past 30 days. Latency does not support the 4-hour window option. 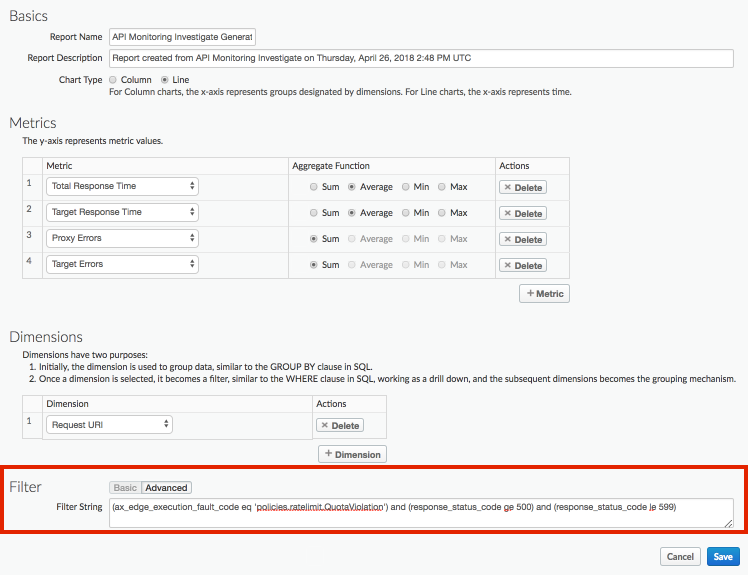 Use the Proxy drop-down box to select Target to view target latencies. By default, the Latency dashboard shows information for the 10 proxies with the highest total P99 latency for the previous hour. Alternatively, use the Top 10 drop-down box to select a specific proxy or collection. You only configure the total response latency percentile (p50, p90, p95, p99). You can only select a one-hour window for latency metrics. You cannot select Any for Region in the filters. You must select a specific region to view. The Latency per target graph shows the top 16 targets based on the maximum latency, with one graph per target. Mouse over a graph or select the dropdown list to determine the graph that corresponds to each target. You cannot download the logs data from the Traffic Logs dialog. However, you can create a custom report or download the analytics data to your own data repository, such as Google Cloud Storage or BigQuery, to perform your own data analysis. Click a block in the matrix to display more detail. In the right pane, click . The custom report page displays in a new tab with relevant fields pre-populated. Note: See Creating custom reports for more information about the default custom report settings. Edit the custom report, as required. See Manage custom reports. Click Save to save the custom report. The report is run using the data collected over the last hour by default and the data is displayed in the custom report dashboard. See Exploring the custom reports dashboard. On the Reports page, custom reports that are generated using API Monitoring are named using the following format: API Monitoring Investigate Generated. View API traffic details at the time the alert was triggered. View contextual information about the alert, including time that the alert was triggered in the center of the graph. Click Condition details to display the details for the alert condition in a pop-up window. Click Manage alert to edit the alert. Click View report (if available) to view a custom report. Enable or disable auto-refresh of the page, as required.